The new $4.5 million terminal, which is scheduled to open in June, is expected to attract more air traffic to the small city-owned airport and to serve as a destination for the entire community—young and old, aviators and non-aviators. The two-story, 12,500-square-foot structure replaces an aging, non-descript trailer that previously housed the airport management offices and an old metal hangar that housed FBO facilities. The small city-appointed committee that oversaw early planning for the project insisted that the new terminal include more than just office space for the airport and FBO. Members also wanted the new building to present a professional appearance for the airport, portray the area’s aviation history and provide space for airport meetings, community gatherings, private events and educational opportunities for local youths. After listening to the committee’s feedback and meeting with Echard to review design options, Passero Architect Christopher Nardone began sketching a building that resembled a Corsair. “That’s where the ultimate concept started—right after the committee meeting, on a blank piece of paper,” Holesko relates. A month later, the firm returned with a more refined drawing, and the committee unanimously embraced the concept. Landside visitors enter the building through the tail section, which also serves as a porte-cochere; airside entry occurs through the nose area. Inside the building, a half-scale Corsair replica hangs from the ceiling of the two-story lobby under a skylight shaped like a cockpit. The structure’s inverted gull wings, constructed from steel, shelter an observation deck on the airport side of the building and a shade hangar for aircraft that park on the FBO side. Nardone describes the inside of the building as “very open, resembling a large fuselage.” One side of the building houses FBO facilities on both floors. Features include a reception area, shower room for pilots, kitchen/café area, a large conference room and executive offices. The first floor of the other side of the building houses more FBO space—a pilot lounge, flight planning area, small conference room and public restrooms—plus the airport administration offices, a breakroom and additional public restrooms. A breezeway connects the two sides, and restrooms on the airport side are accessible from the breezeway. On the second floor is a large administration conference room with a catering breakroom and the covered observation deck that is open to the public. Passero’s design separates the airport operations areas, public areas and FBO facilities, so that when the FBO is closed, the rest of the building, including restrooms, can remain open, accessible and operational. Airport facilities span about 4,800 square feet, including the covered observation deck and breezeway. The FBO occupies approximately 5,500 square feet, plus another 2,200 square feet for the shade hangar. In order to meet requirements for funding from the Florida Department of Transportation, the terminal was designed to withstand 140 mph winds, which is the threshold for a Category 4 hurricane. For example, the exterior was constructed with concrete block walls and finished with stucco. Project funding came from several sources. 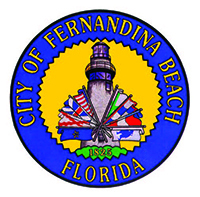 The airport provided $1.342 million, and grants from the Florida Department of Transportation covered another $1.64 million. A $356,355 FAA grant and $352,590 Florida Department of Economic Opportunity grant defrayed other costs. 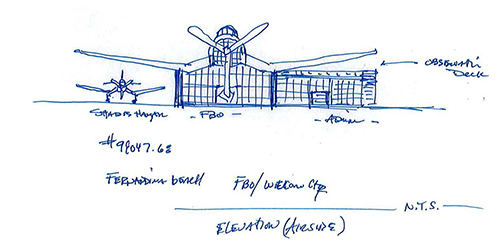 In addition, Bent Wing Flight Services provided a $286,500 no-interest loan to acquire and install the nose and tail of the building, plus a $50,500 interest-free loan to support early design/engineering costs for the project. Both loans were part of the company’s winning response to the airport’s request for FBO proposals. The airport will repay the loans by issuing rent credits. “It was an upfront funding source that allowed us to complete the nose and tail of the facility,” Coyle explains. Bent Wing also purchased the Corsair replica and upgraded fixtures to the tune of an additional $120,000. Bent Wing began operating on April 1, replacing the former FBO that had been at the airport for 25 years. As owner of the new FBO, Echard hopes to attract more flight activity.